This thread is for live updates and comments regarding the Rolling Stones Los Angeles May 20 show. Please tell us your pre- and post-show thoughts and comments here. Edited 1 time(s). Last edit at 2013-05-21 00:13 by bv. So many questions..who will guest? How or If they will change up the setlist from previous LA area shows? Could we be in for some special suprises tonight? Will Lisa sound better? Adding a t to your thoughts there bv, the lack therein has been bothering me. It would be awesome to have Johnny (Rotten) Lydon as a guest, since he loves side 1 of Exile. Lydon on Rip This Joint would surely rip that joint. Is he in town? Has he been asked? Probably won't happen, but that would make for an interesting--even remarkable--moment onstage. Thanks for telling. The "t" typo has survived copy&paste but is gone from now on! No worries, you have been a little busy. No special guests mentioned yet? Maybe it will be the ultimate MICK TAYLOR NIGHT!!!! Thank God we are out of Anaheim. Did anyone notice the Nazi vibe Saturday night? Starting with the Really Milataristic Bible Thumpers lined up every ten feet outside the Honda to the completely obnoxious Honda Usher who got into my face during Brown Sugar because I was one foot into the aisle and then the infamous Exit route created by who knows who to make sure we CANNOT get on Katella to easily get back on the 5 Freeway but wind up on some back road on the outskirts of Anaheim. Anyway glad to back in La La Land tonight! 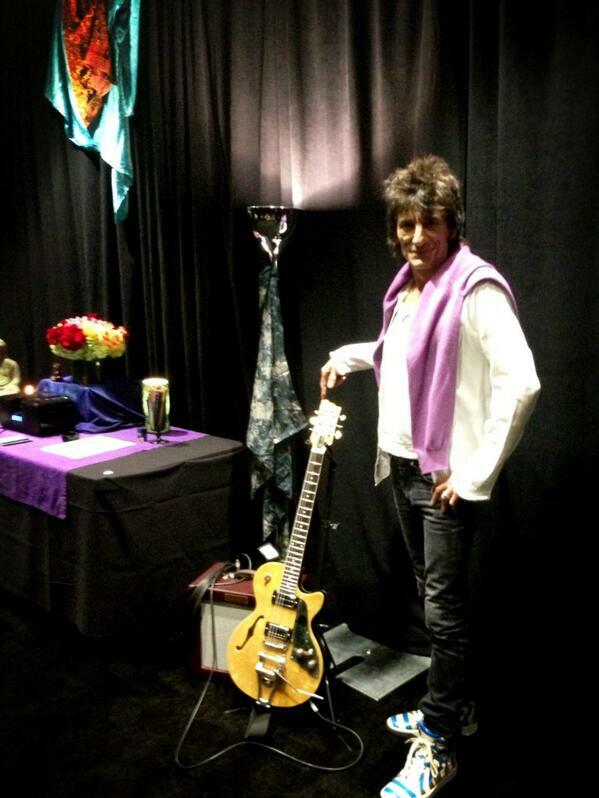 @ronniewood Here's my backstage guitar (and shoes!) ~ I'm relaxing here for now reading and answering your tweets! Edited 1 time(s). Last edit at 2013-05-21 02:05 by kowalski. Oh, Ronnie is so lame these days! What happened to necking four pints of Guinness and slamming back the double vodkas, eh? Have a great concert tonight. Do not throw up on your shoes. I had my concert last Wednesday. I am not jealous. Just happy to remember one of the best nights of my old life. Is the venue filling up? Are the lines as opening night for the 85'ers? Great photo! Now let him play more than 2 songs! It's just Randy Hansen in blackface again. Expect complaints. If they can bring back Hendrix it wont be long until the Bryan Jones folks start popping up... Then we'll start hearing about the 4 or 5-guitar onslaught! wow -the guys smoke marlboro lights now? Man does this give me goosebumps. Just the thought of Mick Taylor back in the dressing room with Ronnie brings tears to my eyes. Is this really happening? I dreamed it long ago, and by god it happened! Still seems surreal. That's a great shot. Really heartening to see him back in the fold. Ronnie, for all his foibles, is a great human, and a great ambassador. "Red House"! Taylor and Jagger have both performed it right? Wonderful picture of the two of them. Have fun tonight everyone. We are now in Palm Springs......which is at least the same state! Would have loved to be at the show. Hey Stonesrule and Bluzdude.....maybe catch up next week when we reach LA? Ronnie and Taylor looks really great. Not enough can be said for Jagger's example of good health. We know he's been on Taylor for his weight and Ronnie for being Ronnie but here's the proof that these guys are giving their best efforts for the fans and one another. An honest attempt to earn the big money they command. I'll toast these evolving rockers tonight with carrot juice...BRAVO!